Submitted by Taps Coogan on the 12th of June 2015 to The Sounding Line. The UK went from balanced trade to massive trade deficits rapidly after joining the EU in 1973. The UK became a net importer from the EU and British exports to the EU have grown more slowly than other non EU countries like the US and Canada. In fact, the UK’s exports to the EU have not grown at all for a decade and are now smaller than the UK’s exports to the rest of the world. The overall economic growth rate of western European countries outside of the EU has been faster than those in the EU and the UK has experienced uniquely slower growth. While listening to an interview with renowned economist Martin Armstrong (here), he briefly mentioned that the UK’s GDP growth rate peaked in the 1970s when the UK joined the EU. 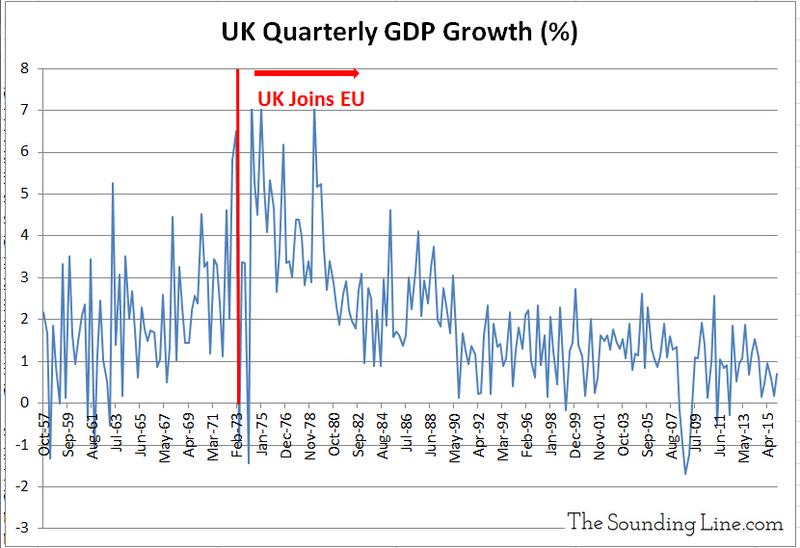 Based on that comment, we went ahead and made a chart of the UK’s GDP growth rate which shows that, true to Mr. Armstrong’s comment, the UK’s quarterly GDP growth rate was accelerating before joining the EU, peaked shortly thereafter, and has declined in the decades that followed, resulting in less than 1% quarterly GDP growth today. The UK’s GDP growth rate has been trending clearly downward in the four decades since joining the EU. This chart shows that membership in the EU has coincided with a steady decline in the GDP growth rate for the UK. While many factors have contributed to this decline, and it corresponds to declines in some other developed economies outside the EU, it is clear that the EU has, at a minimum, not translated to accelerating growth for the UK. Probably more meaningfully shows the end of the Butskil consensus, and the intial burst of wealth achieved by selling the farm in the earlier years of the Monetarist consensus that replaced it ? Hi Taps, I am just in a dispute with someone on twitter re the above graph. They are alleging it has been fabricated. Please is it possible to show where the information/source it came from so I can shut them up please?